Charlie, a curious boy with a dangerous dictaphone habit, eavesdrops on the eccentric guests of the Mirage Hotel. Sean, an Irishman who’s given his heart (and the best part of his liver) to Bwalo, struggles to write the great African novel—if only his crazed fiancée and fierce thirst would stop distracting him. Josef, the mythmaker and kingmaker who paved the way for Tafumo’s rise to power, starts to hear the ominous rattle of skeletons in his closet. Hope, the nurse caring for the king, keeps the old man alive, maintaining the façade of the powerful ruler as she mourns her own broken dreams. And in the countdown to the Big Day, storm clouds gather as a petty criminal, Jack, smuggles something into Bwalo—specifically to the Mirage Hotel—that will change the lives of all of them forever. 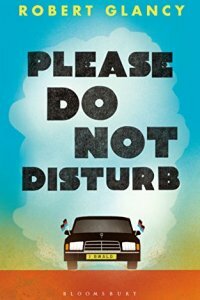 PLEASE DO NOT DISTURB comes with a wonderfully evocative sense of place and people, delivered with an affectionate comic touch. There's something reminiscent in here of lots of these styles of novels set in developing nations, where the people in positions of power and leadership are over the top, the worker's invariably put upon, hard working and blessed with bucket loads of patience and understanding, and everything seems to sort of muddle along in a way that would drive incomers mildly mad if you didn't see the funny side of it. Glancy does a terrific job here at pointing out the absurdities in elegant prose. It is, however, populated by a huge cast of characters, contributing a lot of similar narrative voices to a plot which is frequently overcrowded with points to be made, and lacking forward drive as a result. Great sense of place and character though - possibly just needs a bit more focus, drive and maybe a more judicious spread of the personalities over more than one outing.